In Heather Atwood’s inimitably beautiful style of writing, she presents a treasure trove of coastal Massachusetts history told through the culinary lens of cuisine and customs. 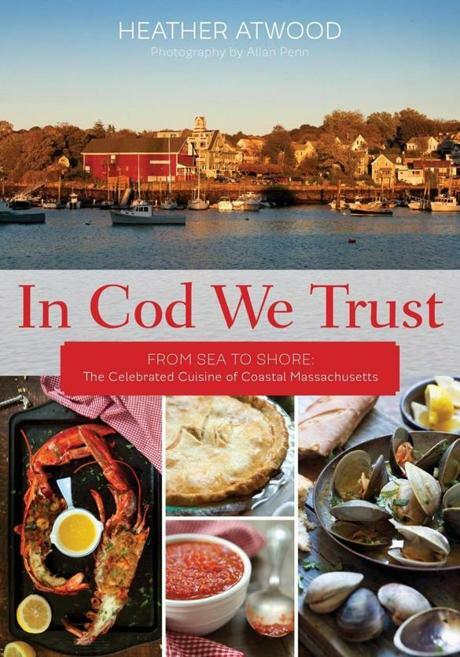 I am looking forward to delving into In Cod We Trust: From Sea to Shore, the Celebrated Cuisine of Coastal Massachusetts! Published by Globe Pequot Press, In Cod We Trust is available to purchase from Toad Hall Bookstore, the Bookstore Gloucester, and from Amazon. For a sampling of recipes, read this recent Boston Globe article. The Massachusetts seacoast is as varied as the coast of France. Built on whaling oil and hauls of cod, fishing villages from New Bedford to Rockport emerged as distinctively different cultures––different accents, different customs, different recipes––like strewn pearls along the tidal marshes and granite promontories that make up the Massachusetts shore. When people think of dock-side dining in Massachusetts they imagine buttery toasted lobster rolls, steaming bowls of creamy fish chowder, and alabaster-white slabs of baked cod piled with bread crumbs, but its rich and varied cuisine reflects all who have come to call these seaports home. Cultures––including, Sicilian, Portuguese, Finnish, and Irish––were so tightly bound that generations have stayed and continue to leave their culinary mark on coastline. Their culinary influence shows in the sweet smells coming from the bakeries and restaurants. It’s a cuisine almost frozen in time, but ever reflecting the Atlantic Ocean. In Cod We Trust features over 175 recipes that celebrate the area’s unique place in the culinary world, and is a photographic journey for both people who love the area and those who hope to visit one day. Heather Atwood writes the Food for Thought column in The Gloucester Daily Times. She lives in Rockport, once a part of Gloucester, now a small fishing village at the far northern tip of Cape Ann. She loves learning about local food traditions from Cape Ann families who have lived here for generations. Heather also has a food blog at HeatherAtwood.com, and produces cooking videos for the production company, MPN. She writes: Unlike most of the world which thrives on tradition, I don’t really like making the same thing twice. I return to a few recipes – pizzocheri, Tourteau Fromage, Asian noodle soups, butternut squash and sage lasagna, Nico and Amelia’s smoked fish – but I get restless. I always ask people what they’re eating, because it tells me a lot about them, and it might give me an idea of something new to make for dinner, or it might remind me of some old standard I’d forgotten. Even better, what they choose to tell me might lead to a story. I like stories about food almost as much I like lunch, my favorite meal of all. Lunch might mean meeting a friend, eating with a daughter, or eating alone, but it’s still part of the day’s beginning and not yet its end. I live in a house with a name – Howlets – a century-old stone house once owned by a family of painters. We have a cat named Clara who sleeps a lot, Martha, a brave Corgi, a large yard with old crabapple trees, two quarries, and a view of Ipswich Bay. I give dinner parties. Sometimes we make cooking videos here. I also write a syndicated weekly food column, Food for Thought, for the Gloucester Times. I’m not a trained cook, but I love bringing people together with wine and a meal. This entry was posted in Home and Garden and tagged Globe Pequot Press, Heather Atwood, In Cod We Trust on July 21, 2015 by Kim Smith.